In the search for authentic Mexican food in Raleigh, I had three main targets to eat at: Los Cuates, Fonda y Birrieria Jalisco along with Taqueria El Toro. And FINALLY, I made it over to Taqueria El Toro! 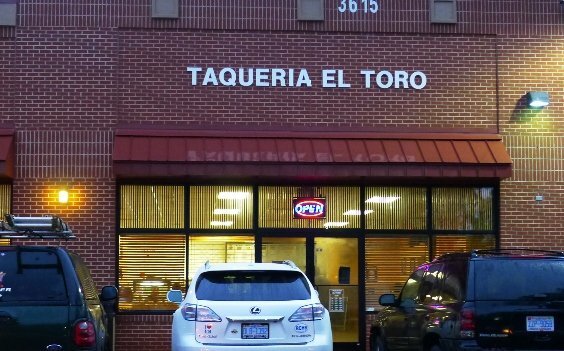 Located just south of Tryon in S. Raleigh, Taqueria El Toro sits in a small plaza with a hairdresser and El Toro Market. 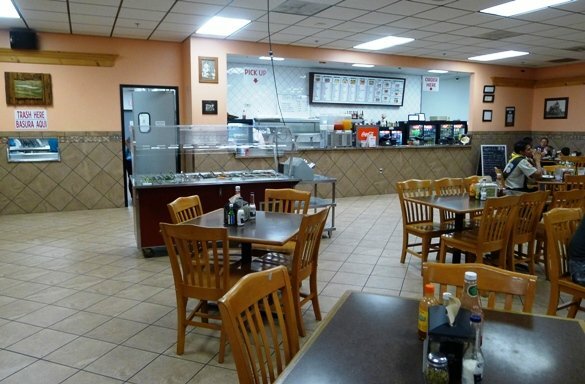 Plain brick front, Taqueria El Toro has a large open dining space and back-counter to put your order in. I notice pretty much everybody here is Mexican so get ready for some authentic eats! Over the counter there’s a long-ish menu of sopes, tortas, tacos, gorditas, burritos and more. A case of Fanta, Jarritos and beer on one side, there’s s big kitchen in back pumping out the food. Put your order in at the register and wait for your number to be called out! 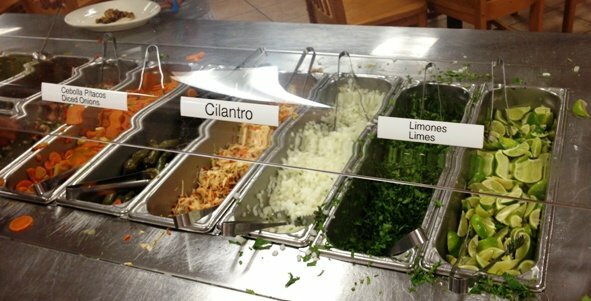 Taqueria El Toro’s condiment bar has gotten some serious acclaim, I see peppers, carrots, hot sauce and more. Impressive but not quite blow you away, impressive. There must be a large kitchen in back because food and trays are coming out like clock-work. The dining space here is substantial, probably twice as big as Los Cuates so the kitchen better be efficient. Ten minutes later my meal comes out: one el pastor sope along with a carne asada burrito on a tray. I grab some spicy roja sauce and it is time to chow down! I went with two different meats (pork, beef) to try things out. 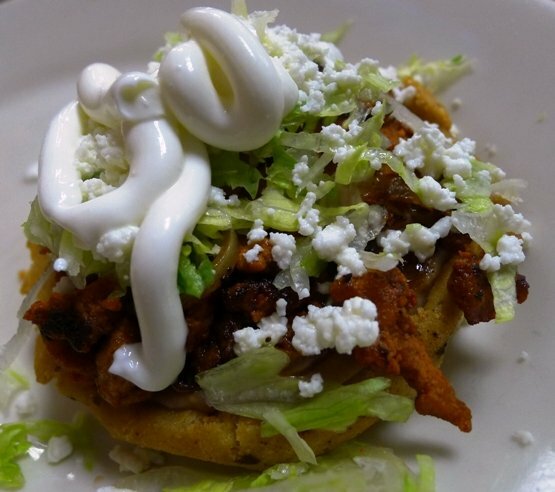 The sope is a large disc made of masa and topped with pork, cilantro, cotija cheese and some sort of white sauce (mayo? aji?) The masa is pan-fried or griddled on the bottom giving it a crisp and snappy bottom. On top it’s softer and chewy along with the meat for some nice contrast. 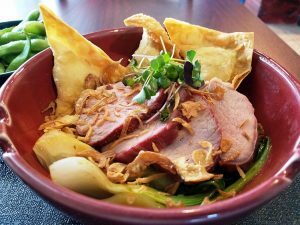 A nice dish but for some reason I found it under-spiced or under-seasoned which surprised me. 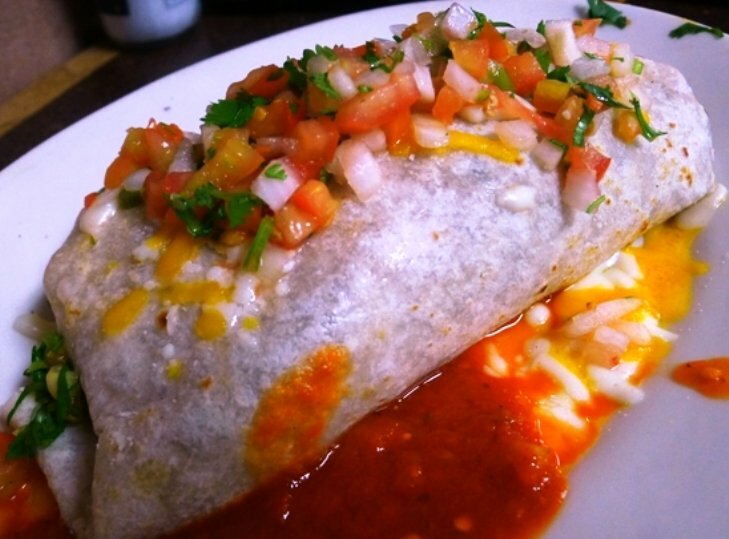 The burrito is a large beastie stuffed with beef, onions, rice, refried beans along with some pico de gallo and melted cheese on top. This style of burrito is more similar to my old SF burritos but the refried beans, onions and bits of lettuce are a bit unusual for me. Paired with the rojo sauce it’s a satisfying bite and the burrito looks to have been baked or broiled a bit before serving, giving it more texture. Overall Taqueria El Toro does a fine job with authentic Mexican eats, I’m pretty sure all the customers in the dining room would attest to that. But I’ll be honest with you, I thought the meats that I tried were a bit flavor-light and I prefer the burritos at Los Cuates which is surprising. But if I was in S. Raleigh, Taqueria El Toro would be fine for a quick and filling Mexican meal. Bully for you! Thx for this review. This place is located over on my side of town and I have been thinking about giving it a try. I’ll have to stop in now! Hey Randy, it’s worth an effort and if you ever happen to be on Wake Forest Road, definitely check out the other two places I mention at the beginning! I regularly patronize Los Cuates. Even though their prices have crept up more than expected in the last few years, you still get a lot of food for your money there. My favorite is the muchacho burrito. 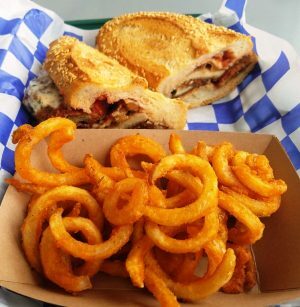 Lasts me for two days of lunchtime goodness when accompanied by all the good stuff from the sauce bar!